Should IV Drug Users Get AIDS Drugs? Economic and geopolitical instability can be the worst enemies of medicine and public health. Unfortunately, there is a disaster in the making in Africa the continent that has been hit hardest by AIDS. It's horribly ironic that the very drug that had the potential to slow, or even stop, the AIDS epidemic that has been ravaging the region is being improperly used, resulting in new HIV strains that are now resistant to it. The drug is tenofovir the miracle drug that has been so effective (especially when combined with emtricitabine to make the combination drug Truvada) that it has not only restored the immune function of HIV-infected people, but also prevented the transmission of the virus from HIV+ men to uninfected women ... when used correctly. But it is not being used correctly. Specifically, tenofovir is being used sporadically in certain areas, and this is the "best" possible way to ensure the emergence of resistant virus. The concept is much the same as the when patients fail to finish a full course of antibiotics, this contributes to the growth of resistant bacteria. Worse still was the magnitude of resistance. A recent study in Lancet Infectious Disease found that 60 percent of HIV strains collected from more than 1900 HIV+ Africans were resistant to tenofovir one the vital drugs that has been used around the world to treat and prevent HIV infection. Additionally, 20 percent of Europeans who were tested also were infected with tenofovir-resistant strains. Much of this problem can be attributed to improper dosing, as described in a posting by the University College London titled "Resistance to key HIV drug 'concerningly common.'" "Resistance to a drug usually occurs when a patient doesn t take their medication regularly enough, and for first-line treatments to work patients generally need to take their medication at least 85-90% of the time," the posting read. "When treatment is interrupted, the virus can develop a resistance to the drugs." The diagram below demonstrates how simple this can be. 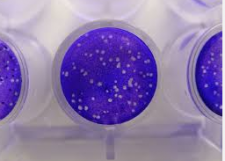 All viruses will contain a small number of essential enzymes, each of which having a function in viral replication. When one of these enzymes is inhibited or deactivated, replication will cease. Enzymes have a specific structures, a portion of which is called the "active site" the location where an essential biochemical reaction takes place. Drugs can be designed to block this site and "turn off" the enzyme, effectively stopping viral replication. 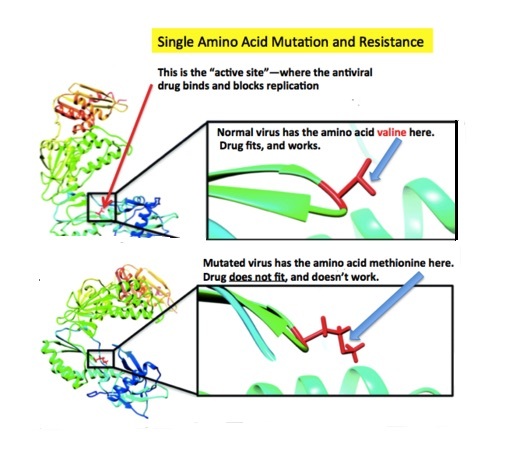 However, once the virus mutates, a very small change in or near the active site (often as little as a single amino acid) results in a different size and shape at this binding site, which can cause the drug not to fit. Then, then drug will not work, and this particular strain will replicate and possibly predominate. Then, we will see more and more cases of HIV infection that will not be treatable with older drug. This is a classic resistance scenario. Resistance is simple, amazing and deadly. It can sometimes be controlled, but the virus will always have the advantage over time. Improper use of antiviral drugs will only make that time shorter. NOTE: For a simple look at the incredibly efficient way in which viruses function, see here.